A Taiwan Arts Exhibition featuring five Taiwanese artists: Peter Lee, Michael Soong, Grace Chu, Stella Kwan, and Chris Ho is on display at Phoenix City Hall. Their exhibit runs from September 18 to 29 at City Hall and from October 2 to 20 at the Arizona Capitol Museum. 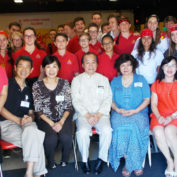 These displays honor Phoenix and Taipei’s 38-year sister city relationship in addition to Arizona and Taiwan’s 37-year sister state relationship. Both relationships have been very active over the years. Hosting this international art exhibit from Taiwan as well as having the artists themselves visit involved fundraising and coordination between these in-demand artists in order to bring the exhibit to fruition. 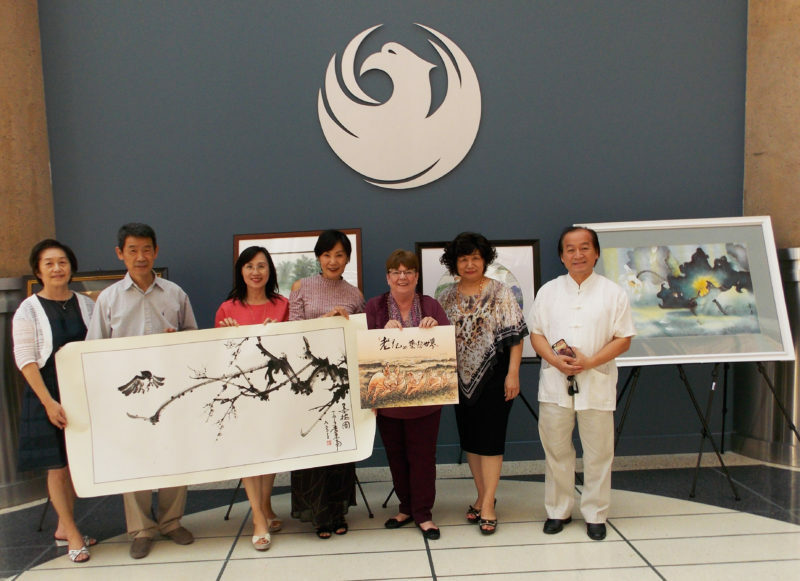 Hosting Taiwan arts exhibitions in Phoenix enriches the arts and culture of the community; promotes global arts, cultural awareness and diversity; and, contributes to a positive economic impact through the arts for Phoenix. Phoenix Sister Cities Taipei Committee is most grateful to Mayor Greg Stanton and the Phoenix City Council for their strong support of Sister Cities and the visual arts. Live demonstrations of the art, given on September 18, 2017, will be aired on Phoenix Channel 11 and can be found here: https://www.youtube.com/watch?v=0K5da_esKnA&feature=youtu.be. Five Taiwanese Artists instructed Chinese Calligraphy and Painting at Seton School for over 200 students with live demonstrations on September 19. 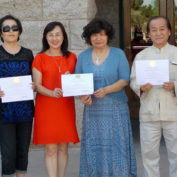 US Congressman David Schweikert provided Congressional Certificates for the five Taiwan artists on September 19. 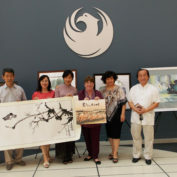 Councilwoman Debra Stark welcomed five Taiwan artists at Phoenix City Hall on the morning of September 18, and Taiwan artist Peter Lee presented Councilwoman Debra Stark with a unique painting.